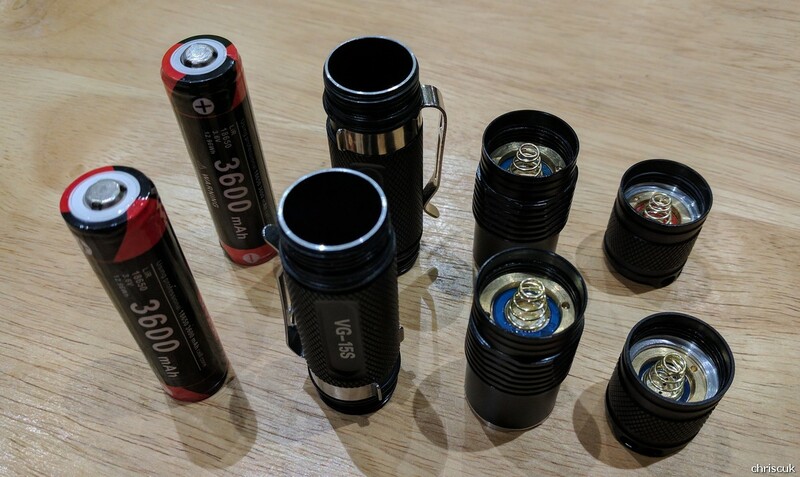 I was asked by Thorfire if I’d like to review one of their lights and I thought it’d be rude of me to say no – a few days later I received a VG15S in the post. First off the packaging. Nothing too fancy just your standard brown box with the flashlight securely located inside. They throw in some spare o-rings and a spare tail cap. and when you take the light out of the packaging it looks identical to the VG15. I looked for a while and the only visual difference is the S on the body. Physically the lights feel the same. I put them on the scales and the VG15 weighs 70g and the VG15S weighs 66g. I thought, heh I might aswell take them both apart and check each part to see if they really are the same. Please note whilst the head is the same length between models it seems that the reflector is actually shallower meaning you’ll get a bit more flood. You can see that in the pictures. In the hand they feel exactly the same until you try and turn one on. The VG15S has a much softer rubber boot to the tailcap. The rubber feels of a higher quality than the VG15 rubber but at the same time the difference feels a bit “odd”. I think I like it but you certainly notice it. 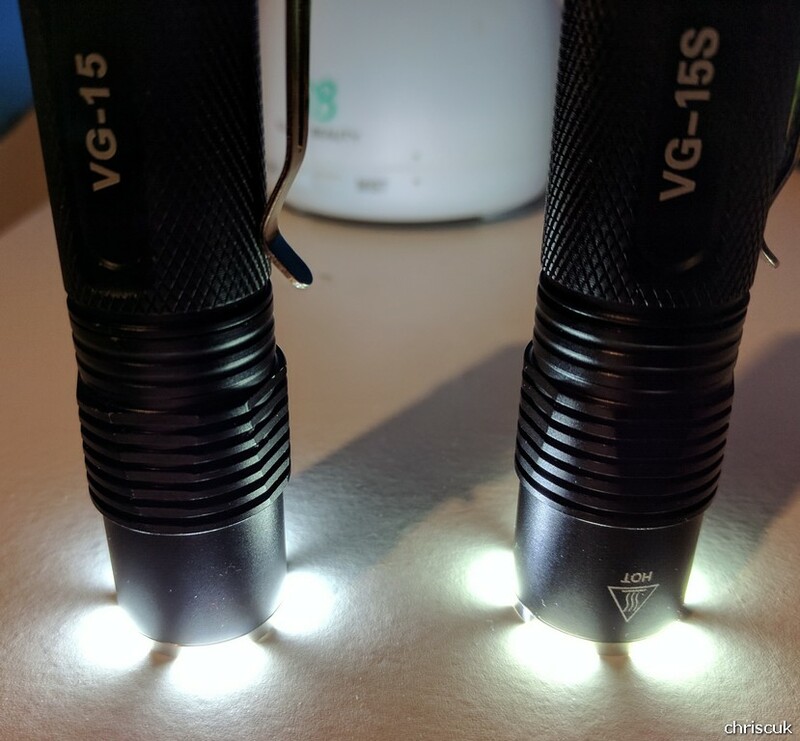 The VG15 has 4 modes whilst the VG15S has 5 modes. I checked the current draw with the battery out of my Klarus XT12GT as it seems to enjoy high drain devices and on previous tests it seems to give me good results. 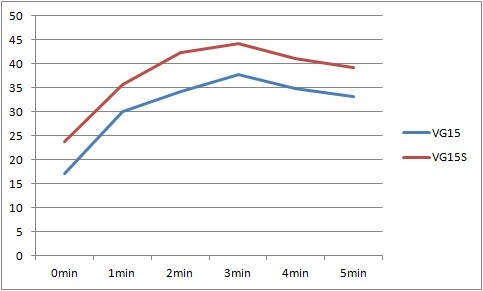 I fortunately had two batteries and both were sitting at 4.25v at the start of the test. 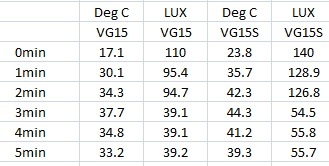 So the VG15S draws more current, time to check LUX…. I don’t have a fancy set up for checking LUX I just have a place that I always use in my bathroom to check ceiling bounces. All lights get put in the same spot and the meter in the same spot so whilst my numbers might be meaningless they are actually okay to compare the light to other lights. As both the VG15 and VG15S get hot when on “full pelt”. I put both lights on the side and measured the temperature with a IR thermometer along with the LUX at different intervals. There is definitely a timer controlling the step down. It happens at exactly 3 minutes. I took the results just after the 3 minute mark to indicate stepdown. There is obviously a different driver being used in the VG15S because there is a bit of a delay when you’re changing modes. I’m not quite sure why this is but it is a bit odd. Honestly, I dont like it but it’s definitely not a show stopper. The delay isn’t huge it is just not instant. I’ve got LED lights at home that have what I can only describe as a soft start, this is no way near as bad as that but it’s not a instant mode change. I might get a night time garden shot but I’ve pushed myself to get the review of this out quickly so haven’t had a chance. Sorry. 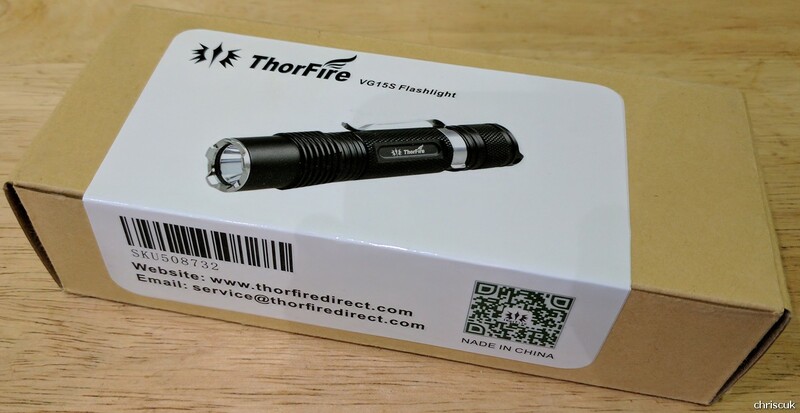 I could spend ages explaining the quality of the components and the feel of the item but everyone has read reviews on previous Thorfire products and they know that the quality is great for a budget item. 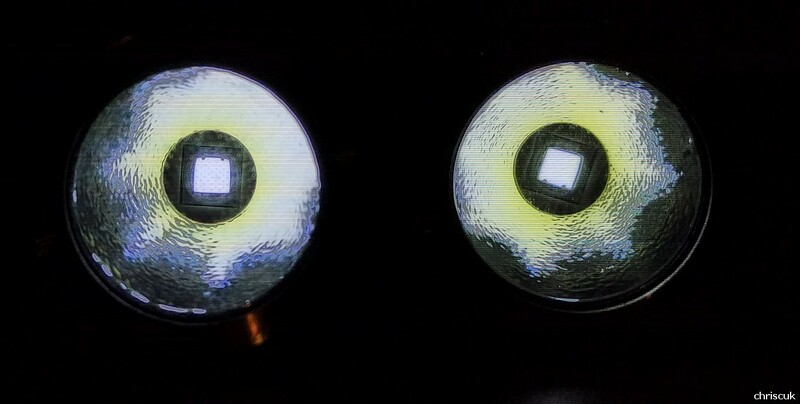 The VG15(s) both feel much better in the hand than the VG10 and the lights stand up to a fair bit of abuse. The VG15S is only a day old but the VG15 has had a fair bit of abuse. I’ve used it under the car and dropped it on the concrete a number of times. I’ve given it quite a hard life but the finish on the light shows not many blemishes so the anodizing on the body seems decent. The VG15S is a nice upgrade the the VG15 in my mind. The tint is a real winner and the extra output seems like it could be useful. Honestly, you wont notice the difference by eye. I tried by overlapping the hotspots and one always looks brighter than the other until you swap around then the other seems brighter. This light is great. It’s a nice change to the original and if buying new I’d buy the VG15S over the VG15 but if you’ve got the VG15 already unless you need a different tint you wont suddenly get a heap of extra light out of the front to make it worth buying it as a replacement. I would say that this light would be a perfect emergency light to keep charged and ready as it’s got a lot of different brightness modes – some of which you could use for a couple of days if needed! 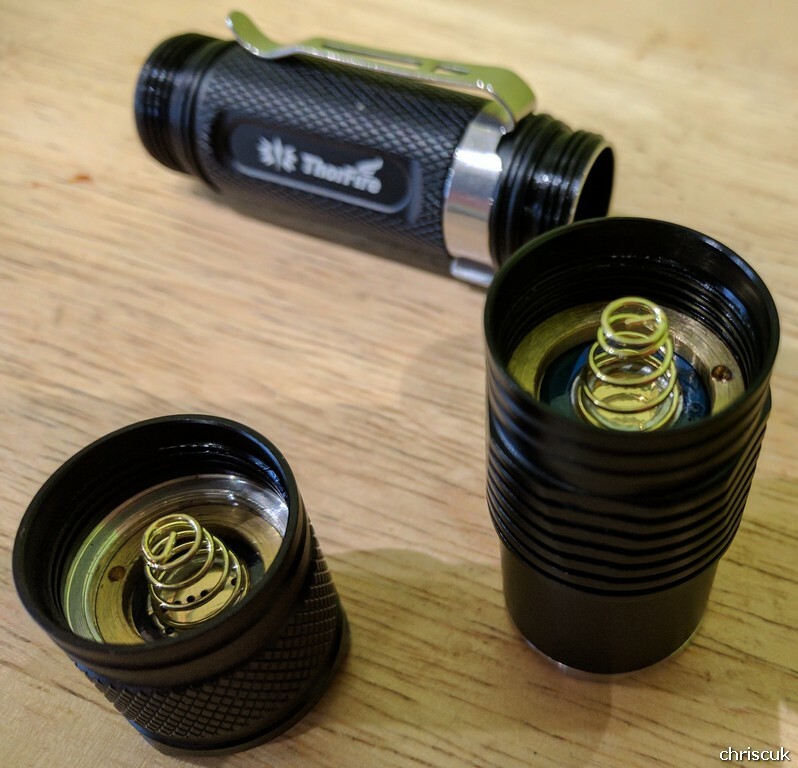 I’m thankful of Thorfire for giving me the chance to do this review and because it’s cost me nothing I’m happy to gift it to another BLF’er. To cut down on postage cost I’ll put the spare bits in the tube and ship it in a jiffy bag rather than the box. I’ve not checked on postage costs and I’d prefer to limit it to UK only but as long as it’s not more than £5 to post I’ll cover that shipping to wherever. I’ll give it two weeks to see who might want in on this. It also ties in perfectly with it being the end of the month. Put your name down if you’d like to win this light. If you’ve got a sob story or another reason as to why you want this light put something next to your name and I’ll put your name in TWICE. …. I might just scrap the whole sob story but the list will keep getting updated. Pics are not showing for me. This model should have been updated to an XPl or XPL-Hi as well. That would have been special. Thank you for taking the time to review this light. I personally feel that the change in tint and the extra mode (and output) are worth it. Sure it could have had a XPL-HI and it’d have been EPIC but as it is, it’s great. The sob story can be made up if you want. If it makes me laugh I might put your name in three times. In the end someone else will own this light and I’ll pay to post it to someone if they want it. SOB story: A friend of mine left Trinidad a year or so ago. She moved back home which was Scotland. I was supposed to give her a light for the farm but we never met (fet moded XinTD). Now she has no super light. She has moved to the city now for a job but , I don’t know which city or even if it’s in Scotland or London since we don’t really talk that much anymore. sigh. If I win, she’ll get the light! Nice review. The S-model seems to be quite a step forward in performance. My sob story is that I am in USA and can not win. But thanks for the review and letting it go to someone that may deserve it. Thanks for sharing your review. I like the charts. Is there some sort of step-down or thermal regulation going on? Somewhere between 2 and 3 minutes, lux falls considerably, and, thereafter, remains flat. I have speculated that the driver in the ThorFire VG15S is similar to the one used by the ThorFire C8s. If true, that would mean that the driver has no PWM, and also that it features a low-voltage warning. Please include me in your giveaway. I am a bit of a ThorFire fan, so I would love to try this one out. If you want to favor members from the UK, however, I'm okay with that, too. Here's a true story from my regular Monday backgammon group. We have a standing joke about making sure you pick up your dice cup—rather than your drink—when you go to roll the dice. Well, my friend Larry didn't roll his drink onto the board, but when his coffee came, he did accidentally pour sugar into his dice cup instead of the coffee. I don't think he was trying to "sweeten" his chances, but when he rolled, out came sugar and dice together! Excellent review on a very nice light. Nice review! Keep up your good work and thanks for your opportunity! 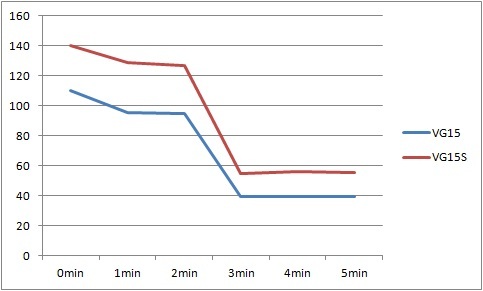 do you think there’s a timer o thermal controlled throttle down at 2-3 minutes? nice light. let me in if shipping to Ukraine is cheap enough for you. Serp I’m sure postage will be fine. It might cost me more but hey ho. I really like this light so I hope one of you will too. Any more people want in on the giveaway? It’s quite a short list so you’re all in for a good chance! Maybe the guy in post #11 ? Or me! Count me in the for the giveaway if it’s not too late. Thank you for reviewing and would like to get in the giveaway. Congrats on the milestone chrisc and good on you for the giveaway.